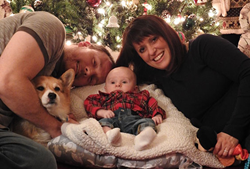 Former Shady Grove Fertility Patients, Steph and Mike Griffith, felt compelled to share their personal story of loss and disappointment to demonstrate the power of perseverance and trusting your instincts. I wish I would have listened to my gut and left those other fertility clinics sooner. Dr. Sasson really listened to our story and I only needed to tell it once. I was also worried about starting from square one again, but that didn’t happen with Shady Grove Fertility. They were fantastic. After years of trying to conceive, various treatments, the loss of twins, two disappointing experiences with other fertility centers, and much heartache, Morgantown, PA couple, Steph and Mike Griffith decided it was time to seek a third opinion with Isaac Sasson, M.D., Ph.D., in Shady Grove Fertility’s office in Chesterbrook, PA. Fortunately for them, Dr. Sasson revealed an underlying endometriosis diagnosis that testing elsewhere had missed. Steph and Mike welcomed their son Luke after a successful round of IVF with genetic testing of their embryos. “I wish I would have listened to my gut and left those other fertility clinics sooner. Dr. Sasson really listened to our story and I only needed to tell it once. I was also worried about starting from square one again, but that didn’t happen with Shady Grove Fertility. They were fantastic,” adds Steph. Among the reasons Steph and Mike decided to share their story was to encourage others to trust their gut, don’t wait to seek help, and surround yourself with a community of support. After recovering from the loss of a twin pregnancy and taking some time off, when Steph eventually returned to work, she found welcomed and needed support. “I began opening up about our story. To my surprise, other people opened up about theirs too. In fact, I must have received five recommendations from folks saying, ‘You have to go to Shady Grove Fertility.’ And that’s how we got to this wonderful place!” shares Steph. Steph and Mike recall their first consultation with Dr. Sasson and remember being impressed with how much time he spent with them. “He asked us a lot of questions and explained his recommendation. He advised that although IVF is often not the first line of treatment for endometriosis, due to my history, we decided to move forward with IVF and a frozen embryo transfer (FET). If we ended up with a viable blastocyst, it would be sent for genetic testing,” shares Steph. “The reliability and high fidelity of pre-implantation genetic testing is one of the most significant advances we’ve seen in the field over the last 10 years. It allows us to differentiate chromosomally normal embryos, with a higher likelihood of delivery, from genetically abnormal embryos that are likely to cause a miscarriage or result in a negative pregnancy test,” explains Dr. Sasson. “I brought up several times with my previous fertility clinic the fact that I had horrible cramps during my menstrual cycle but never had been diagnosed with endometriosis,” recalls Steph. “Endometriosis can sometimes be a missed diagnosis because of its similarity to menstrual cramps. And yet, it’s common, affecting one in 10 women of reproductive age. While the causes of endometriosis are enigmatic and are actively being investigated, we know that as many as one-third to one-half of women struggle to get pregnant when diagnosed with endometriosis,” adds Sasson. “The good news is getting pregnant with endometriosis is very possible with proper care and an accurate diagnosis,” adds Sasson. To learn more about endometriosis, seeking a second opinion, pre-implantation genetic testing, or to read more about Steph and Mike and many other patient stories, visit http://www.ShadyGroveFertility.com. To schedule an appointment with Dr. Sasson or another SGF reproductive endocrinologist, call 1-888-761-1967 or fill out this brief form.